Users at Perth Radiation Oncology and Royal Perth Hospital use Pinnacle3 scripts to modify their system for clinical and research purposes. Under no circumstances is scripting to be used for any purpose unless the user of the script fully understands the possible consequences of using the script including any possible errors that may be introduced into a treatment plan or treatment data. Any script should be used carefully because Pinnacle3 scripts can cause serious errors on the system including system crashes and loss of data. It is possible for data to be corrupted and, if used clinically, for incorrect treatments to be planned and possibly delivered. This document is produced for Perth Radiation Oncology and Royal Perth Hospital and any use of scripts based on this document at locations other than Perth Radiation Oncology or Royal Perth Hospital is at the userâ€™s own risk. 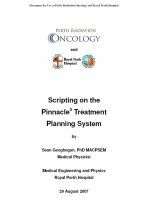 Even at Perth Radiation Oncology and Royal Perth Hospital, all scripts must be validated by the Medical Physicist responsible for the Pinnacle3 treatment planning system prior to use on the clinical system. A similar procedure is recommended for other sites. The scripting language available in the Pinnacle3 treatment planning system is extremely versatile and powerful. It can be used to automate tasks in planning, such as simple scripts that define what colours are used for beams, to more complicated scripts that generate an entire plan based on outlined regions of interest. Pinnacle3 scripting can also be used by the medical physicist when commissioning the system, reducing time taken to import electron output factors and other tedious and error prone tasks. Radiation oncologists can get some benefit from Pinnacle3 scripting with each plan being loaded with identical settings making the system consistent and simpler to use. Unfortunately, due to the very versatility and power of Pinnacle3 scripting, scripting is not supported by Phillips except for very specific uses, and most Pinnacle3 scripting development is left to experienced Pinnacle3 users. This means that various centres have developed their own scripting tools. Some centres have limited themselves to very simple scripts. Other centres have put a great deal of effort into script development once they have recognised the advantages of using them. This document covers all aspects of scripting that are familiar to the Medical Physicists at Royal Perth Hospital and Perth Radiation Oncology. This document provides examples of script development and application by going through a series of scripts that various authors from around Australasia and the rest of the world have kindly made available to the author or were made available through the Pinnacle3 mailing list. There is a CD containing a library of scripts that can be implemented at other centres using the Pinnacle3 treatment planning system with only minor modifications to suit each centre. The author hopes that this document and script library will become the basis of a collaborative working group to further the development and distribution of useful and easily adaptable Pinnacle3 scripts. Because there is little Pinnacle3 scripting support available from Phillips, some of the text in this document is based on educated guesses on the internal workings of Pinnacle3. As such, there is scope for improvement to this document, and any errors should be reported to the author. All scripts in this document must be tested before use, and it is possible that they will not work as intended. This is especially true at other institutions where the scripts have not been tested on nor configured for use on these computing systems. This document and the script library are to be used at your own risk.